What is the true purpose of a sales negotiation? Getting a one sided deal? Highlighting the cheapest price point possible? Delaying for concessions? A sales negotiation is deemed successful when both the parties arrive at a win-win agreement on (almost) equal terms with key view on long term business relationship. The person who initiates the negotiation has a distinct first mover advantage. It is said that starters can direct the flow of a negotiation. Asking or waiting for the clients to start the negotiation will narrow your approach to chasing numbers rather than finding the best offerings. Having a great sales conversation is great, but it is preferable to record the details of the matters discussed and have it mailed to all stakeholders. This acts as a reference point for future discussion and also weeds out ambiguities. Sales negotiations can be pretty hectic and tempers may flare on a short notice. However, a great sales person never loses his temper in the face of pressure, no matter what the provocation. Always be diplomatic and have patience to deal with any kind of situation. The customer is investing his precious money and other resources. Thus, you too shall reciprocate by investing time and effort to find the best solution for his requirements. If the client requests you to make certain reasonable changes or discounts, go ahead and give it. Karma dictates that a genuine person will feel obligated to return the favor. If it’s too good to be true, it probably is. A sales person will always be aware that it is a give and take policy in negotiations. You let go of one point and get something in return. You should be very specific in your questions and for this, prior homework on the prospect is important. By asking relevant questions, you can demonstrate your professionalism and dedication to take the sales cycle forward. For a primer on important sales questions, click here. There are certain etiquette, standards and protocols to be followed for corporate sales negotiations. A good professional is always aware of them. An example would be setting up a meeting, adhering to the schedule and sending a summary report afterwards to all stake holders. A good sales person will always be in the know of their account status. Whether they are active, inactive, ripe for cross-selling etc. This commandment will also be handy in identify customers at risk and taking corrective measures. Always speak the customer’s language. This does not mean that you rush off to learn all the languages available, rather, draft your conversation in comprehensible words that are easy to digest. Using complicated terns and jargon may show sophistication, but this can scare off prospects. Time is wealth for a salesperson. They have to juggle through meetings, briefings, filing reports etc. However, the ability to prioritize tasks and complete it in time separates sales professionals from novices. Stories capture human attention and imagination. So never just pitch a bland sales talk. Create a situation when a client faced enormous situation and you entered as a shining knight in white armor to save his business. Back it up with well drafted and creative collateral. Not every negotiation can be picture perfect. There are unreasonable prospects and clients who will get on your nerves till the time you realize it’s time to walk away. It is better than being treated as a doormat. 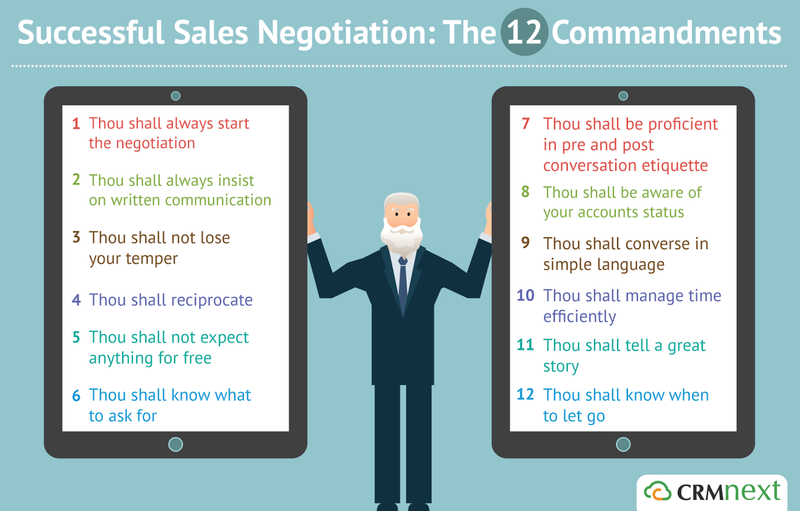 Follow the above 12 commandments in stone to achieve your sales negotiation goals, with the satisfaction of all participants.